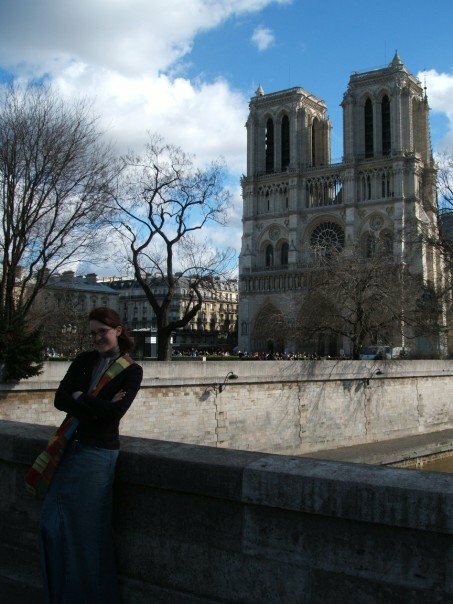 Me at Notre Dame, circa 2007. My favorite memory of Paris is peace. My roommates and I were in the city of light for just three days, and wanted to make the most of it. I was the only one of us who had been there before, the only one of us who was pinching her pennies so hard they squeaked. So one day, when the other girls wanted to visit Les Invalides, I chose to stay behind and wander the streets instead. Les Invalides is located in the 7th arrondissement, a neighborhood of winding cobblestone streets, flapping awnings over twee cafes and light, oh such light! It danced off candy-colored walls as I tripped over the uneven stones, sunlight washing me in early spring warmth, the kind of warmth that feels like a miracle the first time it trickles from the sky each spring. Regina Spektor wound tales of lost love and found happiness through my earbuds, as I smiled shyly at the balding old man in a white apron sweeping the sidewalk outside a flower shop, a little dog on the thinnest leash, his owner smoking an equally delicate cigarette whose smoke drifted behind her like a promise. There’s a park near Les Invalides, a wide expanse of green that was just beginning to brighten, that March weekend. In my wander, I found a little bakery and ordered the only French pastry I knew how to pronounce: a butter croissant. It was still warm, and as I sat on the grass to eat it, a blond little boy in a striped sailor shirt chased a ball past me, pattering in French. Maybe it was the butter coating my fingers and my mouth, maybe it was the romance in my ears, maybe it was the feeling of Paris itself, but that moment still comes back to me as one of the happiest I can remember from that vacation. Paris settled around me like a silk scarf, kissing my shoulders with the gentlest grace. Later, I wandered into a church that smelled like history. The light there was filtered by dusty stained glass windows, their inscriptions describing scenes I’d grown up with in my own Catholic childhood. A Mass was in progress and although I couldn’t understand the celebrant’s words, the rhythm was as familiar as breathing. I’ve always loved that about the church: No matter where in the world Mass is celebrated, it always feels the same. The cadence of transubstantiation touches souls in every tongue. I stood at the back and watched silently as the priest raised the host to the sky, his face illuminated by a single beam of sunlight sneaking through the rose window above my head. There’s something about a priest’s face at that transformative moment that transcends faith, I think. Beatific isn’t the word. There may not be one. But I left the church feeling like my bones had settled back into place. Travel can be disorienting, especially in a country where the language isn’t my own. The frenetic pace of cities especially, can unsettle the soul, but somehow, Paris knew what I needed. Somehow, someone always does, no matter where I am. When I heard what happened in Paris yesterday, my heart returned to that moment. I think it’s called the city of light not because of the way the Eiffel Tower twinkles every hour, on the hour. Not because of the electric blaze of the Champs de Elysee or the candles lining Notre Dame. Because of the spirit of France in the people’s eyes. You can see it everywhere, that certain fire that lives within the French, the certainty in their own civilization, the confidence in their society. The French are a proud people, and they ought to be. To see that fire attacked, dampened by hatred is not just a tragedy for the French, but for all of us. I stand with France, today. We all do. Hate can throw water on that fire, but it can’t put out Paris’ light. It can’t destroy the peace that is Paris, in the souls of its people and the souls of those who love them, their city, all over the world. In a moment when many are looking for someone to blame for the lives that were lost, the security that was shattered, it’s important to remember that love always wins. No religion in the world, no matter its name or what it worships, or whether it worships anything with a name at all, condones hatred. God is love, whatever you call him. ISIS can’t win, as long as we remember that. God is love, and so are all of us. To know that it’s true, just look in a fellow person’s eyes. That fire? That’s love. That’s peace. That’s light. Nous t’aimons, Paris. Nous sommes avec vou.